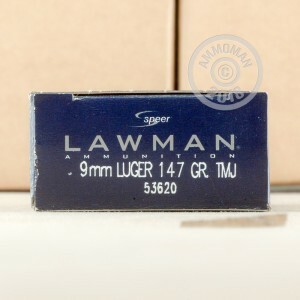 If you use the heavier 147 grain version of Speer's popular Gold Dot rounds, you'll appreciate this loading of Speer's Lawman series, which uses 147 grain total metal jacket bullets and produces identical ballistics to the more expensive carry load. 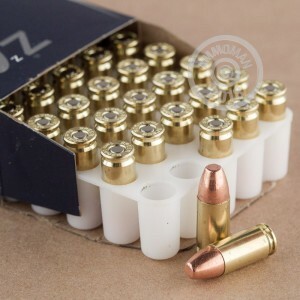 These rounds, packaged in a case of 1,000 (20 boxes of 50 rounds each), use non-corrosive Boxer primers and reloadable brass cases. 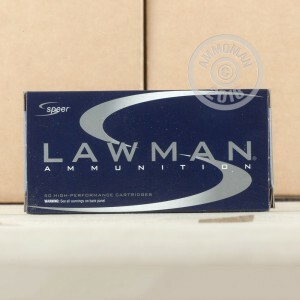 Add more than $99 worth of items to your cart and check out to discover one of the best features of AmmoMan.com: free shipping! That's right: for orders over $99, you only pay the list price. I am running this in a SIG MPX, 16" barrel, with absolutely no failures. I haven't shot beyond 75 yards, but at least out to that distance accuracy is superb. Stays subsonic in my CZ Scorpion SBR, reliable, fairly accurate, reloadable, what's not to like?